The Polish Weekly | Tygodnik Polski » HAPPY THANKSGIVING FOR YOU! Like my own family’s marking of this year’s Thanksgiving Day celebrated every fourth Thursday in November by federal legislation in 1941, this cultural and religious tradition of harvest in the United States, has been observed by presidential proclamation since 1863, and, by state mandate since our Founding Fathers. Three decades ago, I fondly recall gathering at my parents home in Warren, over twenty miles from Romeo, home of this year’s annual gathering for telling tales, and savoring carved, roasted turkey, fresh-cooked cranberries, and, precious, pumpkin pie. Mom, who had just died, was missed and mourned at that meal long ago, yet, it comes up in conversation repeatedly every year, it seems. Despite the death and grieving, Marcy Anna, the oldest of seven behind my brother Lucas who died in Vietnam in ’68, will once more steer the rest of us in what seems to be mom’s mandate to show up. Included in a large family’s trek are difficulties that come with two sets of twins, putting clothes and shoes on all of them with four – Lucas, Marcy Anna, Marlene and Bob -all in cloth diapers when they were born in the mid ’40’s. They’re expected to sit at the large country table with a feast and fare set for kings and queens! 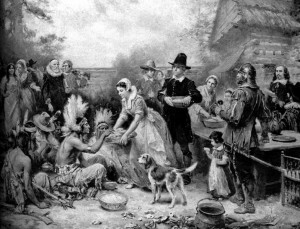 Despite the disappointments, amid life’s tragedies and triumphs, talk will emrge of those who were among the living the previous Thanksgiving, or, the horror of Hurricane Sandy’s thunderous waves devouring humans on the eastern shores, even, a looming ‘fiscal cliff,’ will watch many today huddle together like those Plymouth pilgrims did once upon a time. Even those who may be alone, those denied human rights, the homeless, and, those on the streets, or, those so fragile this year that they will be without anyone, Thanksgiving Day makes it debut, ready or not! And, I imagine each Michiganders own plight and pilgrimage etches lessons learned along the way, and Motown dwellers, among others, already know that life isn’t fair; that you lose some and win some; that you may be rejected by a first, or, another love, lose a job, be passed over for a promotion, get sick, and, one day die (like the countless turkeys on the watch for this day of reckoning). These mysteries or tragedies that are carved into each one’s trek ring out loudest for the most vulnerable young or old, those without health care, or, those without a shelter, or, a roof over their heads this day, for example. Living on their own personal reserves of resources, some communities, leaders, citizens, and neighbors imagine enlarging their own hearts, hearths and homes with that enduring strength and virtue called hope. Yes, they stretch themselves to extend and level the “playing field” as it were for those pilgrims among us in America today who welcome an open hand to clasp and walk with together down life’s dangerous routes. These modern pilgrims unite sides or aisles by sharing even from the little they have to exist. They give, even forgive. Their aim is this Country’s common good beyond selfish accumulation of goods and venture, extreme capitalism with little regard for others. After all, like that blessing for the food and bounty amid one’s own hand that was dealt, whereever one sits this day, here at home, in Iraq or Afghanistan, Beirut, the West Bank, or Gaza, America knows the strength in spaciousness and hospitality for the less fortunate among us. America’s poverty and pitfalls, obstacles, and limitations limp in the face of faith, gratitude when people imagine a way out for those who need a little light for life. Grace and favor are like that! Rev. Lawrence M. Ventline, D.Min. (Reach Rev. Lawrence M. Ventline, D.Min., founding director of the metropolitan All Faiths Festival, and, first executive director of the ecumenical Michigan Coalition for Human Rights, at (313) 530 2777, or visit,http://www.religionrootsrelationships.blogspot.com/).